An idea to compare these two phones is obvious, though they have disparate release time (one year). At first sight Siemens S55 has almost the same features as Sony Ericsson T68i (further T68), there are not so many considerable differences in it. But very often convenience and inconvenience depend on small trifles. Let’s try to compare these phones, taking into account only the main important features. It’s useless to discuss, which model has a preferable design. Tastes differ. 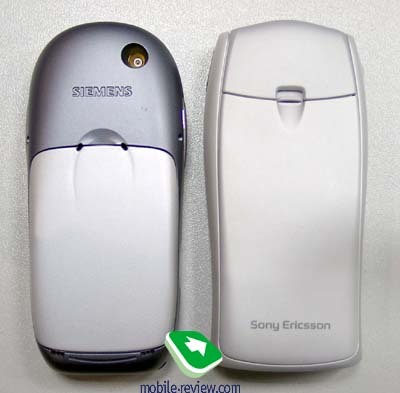 Siemens is a new model, it is attractive to a user, while Sony Ericsson T68i is well known on the market and it became familiar to many potential customers. If to say about ergonomics, it’s necessary to compare phone keypads. T68 has small keys, which are well spaced and they are rather handy. S55 has terraced keys, for the first time such keypad was appeared in the phones from Samsung. Some users didn’t like this keypad, but in our opinion it is more comfortable than the keypad in T68. One of the reasons is that keys are slightly raised under the phone and it is more convenient to press them. But on the other side, if the phone lies face down and you press it, keys can be pressed automatically. If you wear the phone in tight hostel, it's a usual situation. So, you need to use manual or automatic keypad lock. Sometimes (rarely, to say the truth) an automatic keypad unblock can happen, for example, when you bend over something and squeeze a hostel. T68 doesn’t have problems with eventual keys pressures, but such problems can happen with joystick. Phonebook menu can be called or a call can be made if a keypad lock is not switched on. Joystick saves time while working; it allows to move in 4 directions and can be also pressed. S55 has only a 4-way navigation key; in the phones from first lots it is not very convenient to press it up, though there are no problems with other directions. Engineers promised to remove this shortcoming in the near future. We hope that it will be really so. Siemens S55 loses if to say about number of steps (actions), which are necessary to do while moving through a menu. You need time to confirm a selected menu item by soft keys, of course, you can waste only one second to press it, but you have to do it. Shortcut number menu navigation is available in both phones. In both cases keys response quickly to commands. Short-term delays can appear only, when you switch on the phone. Side key in Siemens S55 enables quickly to change a profile in the stand-by mode, while in T68 one can just long press a Hot button. Both variants are acceptable, none is preferable. Phones have comparable dimensions. Siemens S55 measures 101 x 42 x 18 mm and weighs 85 grams, though T68 measures 100х48х20mm and weighs 84 grams. So, let's try to sum up everything. Keypad. Siemens S55 has handier keypad, but keypad lock is demanded in both phones. Keypads are comparable, taking into account that Siemens has not convenient navigation key. On the one hand, T68 has a good joystick and average keypad and on the other, Siemens has an average navigation key and convenient alphanumerical keys. So, there are no great differences, which keypad to choose. In both phones keys response well to commands but in Siemens a confirmation of desired menu item is made by soft key, while in T68 it can be done with a help of joystick. Conclusion: Two models have achieved parity in design and ergonomics. An advantage of Siemens is novelty and T68 has slightly faster menu navigation. Battery type. Siemens S55 is equipped with lithium-ion battery type of 700 mAh capacity, T68 has lithium-polymer battery of the same capacity. However, the phones have almost an equal autonomy in case of equal active using. A shortcoming of T68, better to say, all lithium-polymer batteries, is that it is impossible to use them in a frost day; they run down very quickly. It’s not very important for most of Europeans and even Russians, because usually we wear a phone in a coat, or another rather warm place. The problems with the battery can happen if you, for example, forgot a phone in a car and it stayed there for two hours and a temperature was 15-20 degrees below zero. An advantage of T68 is a possibility to view an expected remained stand-by time and talk time. Display. 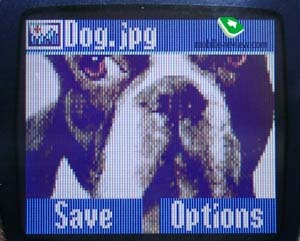 Both displays have an equal size and are capable to support up to 256 colors, they have a resolution of 101x80 pixels. It seemed, that visually they also should’ve been the same, but it was not so in reality. Firstly, screen of T68 is slightly deepened into the phone and it looks smaller, than it is. Technological features of both displays are similar, only pre-installed settings are different. We compared two similar pictures in equal lighting conditions. You see that T68 has better brightness settings and they are wider. Colors in S55 are not always fully displayed, half-tints are blended, what causes shadows on the pictures edges. The same image looks different. T68 has artifacts on the pictures edges, but single pixels are not seen in the main part of the image. In S55 these single pixels are visible. In reality color schemes of menu are more important for an ordinary user than just a graphic picture. T68 has a better picture than S55. One of the reasons is that color schemes are not optimal in S55, very often the picture is seemed dark or too bright. In my opinion blue color scheme is optimal. If you look at white background of Siemens S55 in a stand-by mode, you will notice difference from the main color. We think that T68 has better color rendering and the picture is more natural. In sunny day both screens have the same problems. Ringer. Siemens S55 surely wins the point; 16-tones polyphony varies phone ringing tones greatly. This phone has not very loud ringer (as many other phones which support polyphony), but it comparable to T68. If you one select a simple melody in S55, it will sound louder than the same one in T68. So, no doubt, that S55 is a winner here. Vibrating alert is average in both phones and it is comparable. Conclusion. Strength of vibrating alert is comparable in both phones, but Siemens S55 has a better ringer, it is louder and polyphonic. T68 gains revenge if to say about display, it’s more natural, though, the differences are not considerable. We won’t discuss organizer, phonebook and bluetooth in this article. Though these applications have a different realization, they have similar capabilities. You can make certain of that, reading respective reviews. Here we’ll speak about nuances, which sometimes are very important. We don’t think that it is necessary to estimate realization of functions, because it can’t be impartially estimated. Incoming call. If several phone numbers are added to a contact in the phonebok of Siemens S55, only name is shown while incoming call and not phone number type (home, office, mobile). If a picture is assigned to a name, then, you will see firstly a name (only for a moment) and then a picture, it’s not very convenient. In T68 a picture is alternated with a name and also a phone number type is displayed. Lists of calls. The difference is traditional fro Ericsson and Siemens. A total list of various call types (outgoing, incoming and missed), which are indicated by different icons, is presented in T68. Siemens has 3 different lists. Of course, it is a force of habit, which organization you prefer, but we think that SonyEricsson has a better structure. MMS. Phones capabilities are comparable, but it is possible to receive all settings automatically from operator, using Sony Ericsson. This service is not available for S55 yet. But S55 offers better capabilities if to say about settings. The handset warns you about the message size, has flexible settings, which allows to receive a message automatically (for example, only in the local network, not in roaming). So, the phones have equal technological capabilities, but S55 has more modern MMS interface, while it is easier to create and view a message in T68. E-mail client. T68 has more complicated settings of e-mail client, while they are friendlier in S55. But there is a considerable difference. You can download only messages titles or titles with certain number of lines in T68. In S55 you can download only pre-installed number of Kb (e-mail, which is not more than…). Much information can be contained in not received e-mails. The other shortcoming of S55 is the absence of several codes support, for example, Russian mails can't be read. Memory. There are about 900 Kb of memory in both phones. It can be used to keep data, such as phonebook records, SMS and MMS messages and others. For example, both phones have equal possibilities of voice memo recording (but it’s necessary to have equal memory space). As T68 doesn’t support Java, memory is divided to lesser number of functions; as a result, it has more free memory space. On the other hand, there is a possibility to choose and download games and applications in S55. So, the phones achieve a parity in memory space, but Siemens has better downloading capabilities. 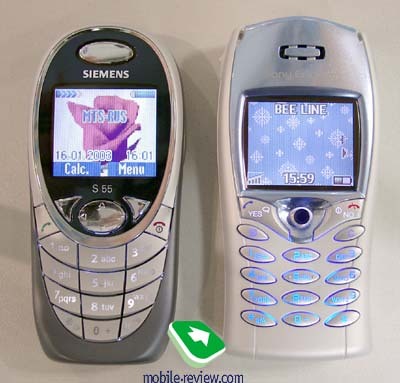 We can conclude that Siemens S55 is revised modern version of SonyEricsson T68i, though it sounds funny. We have a suspicion that these phones have the same hardware; they have even equal memory space. Siemens has a good ringer, handsfree mode, Java. T68 is just well-known phone on the market. Though sometimes this fact is not for it. If you hesitate between two phones, choose that one, which you like most. We can notice that Siemens S55 has richer features, but if you don’t need extra features, which are available in Siemens S55, purchase T68i, it’s also reasonable. Pay attention that SonyEricsson T68i, which was one of the main advanced phones till now, has last days on the market. Beginning of summer would be the end of its life cycle. It means that the price would fall down and a new category of customers will be interested in purchasing it. We think that Siemens shouldn’t be worried about successors of T68, because they will be rather expensive at first, and then they can’t reach Siemens when the price of Siemens S55 goes down. 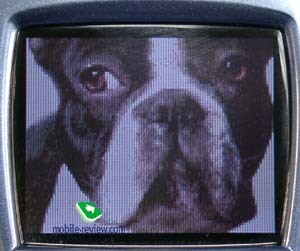 © Mobile-review.com, 2002-2007. All rights reserved.